Jeaga The Jeaga occupied what is now coastal Palm Beach and Martin counties, probably extending into southern St. Lucie County. To the south and north, respectively, they overlapped with their better-known Tequesta and Ais neighbors—to the west were the northern Everglades and beyond that the tribes that ruled the area around Lake Okeechobee. Lake Worth, once a freshwater lagoon called Laguna de Gega on some Spanish maps, was at the heart of the Jeaga territory. Artifacts of European contact are rare in this area, but do include Spanish olive jar sherds, glass beads, and reworked metal items. One remarkable item, found with human burials in modern-day Palm Beach, is a bone dagger, ornamented with incised lines and metal inlays, suggestive of a rattlesnake; x-ray analysis of the metal inlays showed that they were brass—an alloy likely obtained from the Spanish or English. The earliest European accounts and maps of the lower Florida coast occasionally mention the Jeaga, who engaged in the lively recovery and trade of shipwreck materials and maintained an early and long-standing hostility toward the Spanish and other outsiders. Jonathon Dickinson, a shipwrecked Quaker who encountered the Jeaga in 1696, described the Cacique as “dressing his head and painting himself. For his re-entry into his village, the Cacique, one of whose responsibilities was to distribute food, was newly painted red. A copper disc was worn to cover the breasts; the Jeaga thought it a deformity to have great breasts.” This was a very helpful description for me. By simplifying the background, I concentrated all my detail on this remarkable figure. At dusk, two Jeaga women prepare to join in an evening ceremonial dance. One will sing while the other dances until midnight. I blurred the background using muted browns and grays, to keep the focus on the two women. I concentrated on ways in which I can make the women more believable and unified. A Jeaga maiden greets a familiar Florida scrub jay. Both their worlds encompass only a few miles. Scrub jays live tribally in families of up to eight birds. They cooperate in all aspects of family life. This painting demonstrates the closeness of the Jeaga and their environment. Water is a life-giving thing and is scarce in the Florida scrub environment inhabited by the scrub jay and the maiden. I used dull colors in the background to create a calm and mysterious moment. 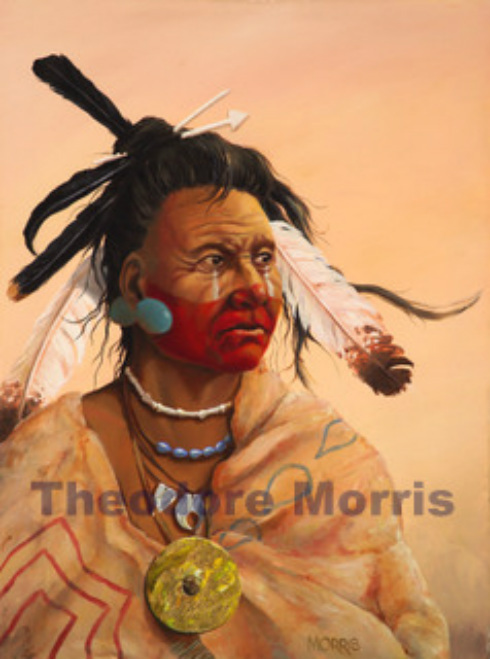 In this painting I show the relationship between the Florida Indians and their spiritual connection with alligators. Alligators were a plentiful source of food and trade for the tribes. "The Indians also eat lagartos, and snakes, and animals like rats..."
A Jeaga maiden greets a familiar Scrub Jay. Both their worlds encompass only a few miles. Like a tribe, Scrub Jays live in families of up to eight birds and cooperate in food gathering, watching for enemies, and even feeding babies. 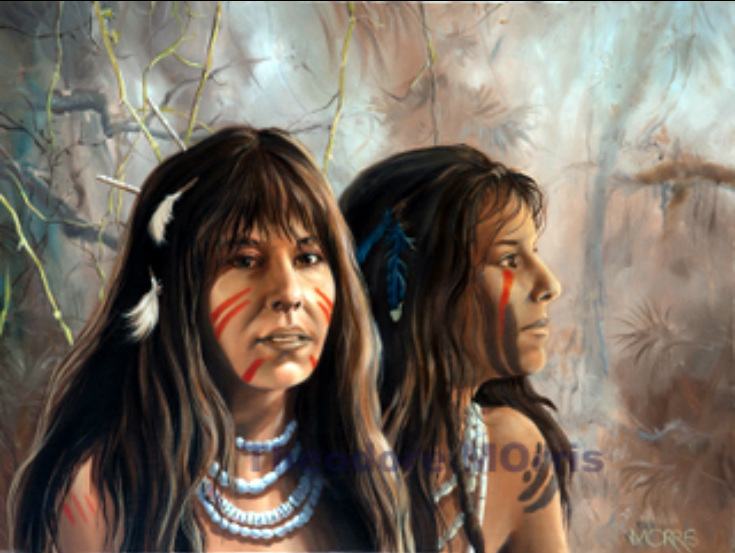 This painting shows the close spiritual connection the Florida Indians had with their environment. Copper and glass beads were used by the Spanish for trade.